Hope website: The announcement will be posted on hope.edu/alert and inHope. Media: The announcement will be shared with local media, including WTHS radio and WOOD, WZZM and WWMT television stations. > Click on “Update Emergency Contacts.” Your name (Relationship: Self) and cell phone number entered as an Emergency Contact will register you to receive HOPE ALERT messages. When weather-related closures/cancellations occur, essential personnel (Campus Safety staff, plow drivers, etc.) are expected to report if at all possible. If unsure whether you are expected to report, please contact your supervisor directly. For those crews that report to work between 10:00 p.m. and 6:00 a.m., please use good judgment in determining whether it is safe for you to travel in for work. Notify your supervisor of your situation and stay alert to later announcements. Stay warm, and good luck with finals! Campusmail is a system at Hope for distributing email messages to large sections of the campus community. It is moderated three times per weekday by Public Affairs and Marketing. The technical side is supported by CIT. When should I send a Campusmail? If you have an event or information that is useful to or of interest to the greater Hope College community, you can send a Campusmail. The message must be Hope College-related and originate from a faculty or staff Hope College email address. Messages can be distributed to all employees, only faculty or only staff. There are some retirees who have elected to remain on the Campusmail system, as well. In extraordinary cases (safety alerts, weather concerns), the messages can also be distributed to students. 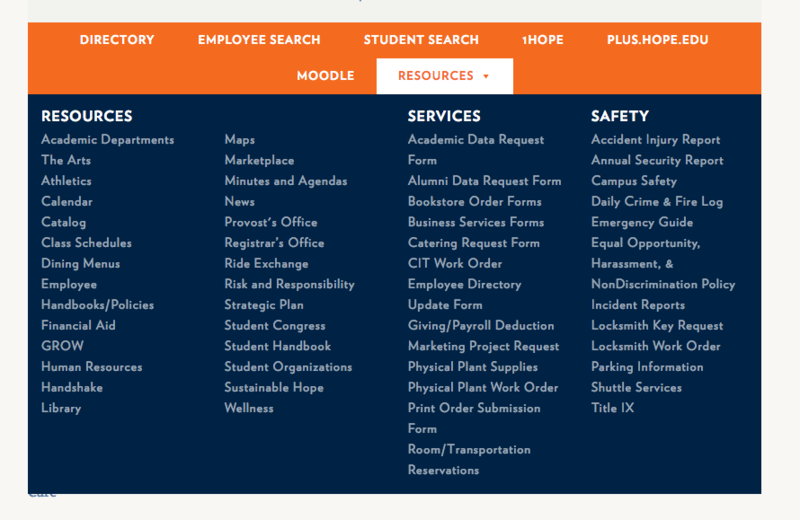 Regular messages to students or specific targeted groups of students (e.g., all Philosophy majors) are handled through the Studentmail system (studentmail@hope.edu), coordinated by the Office of the Registrar. From your Hope College email account, send your message to campusmail@hope.edu. Include a helpful subject line and your intended recipients (e.g., all employees, only faculty, etc.). Also include a CAMPUSMAIL DISTRIBUTION header. Please join Department Name on Monday, 10/1 at 10:00 am for our Special Event. Describe more helpful information here. Check our web site for other exciting events and materials. Use images in emails sparingly. They are not always easily viewed on mobile devices and the contents of images cannot be searched at a later date. Additionally, embedded images can present challenges those with visual impairments. Only one image can be embedded in a Campusmail due to technical limitations. When used, please reduce the file size of the image to <1 MB whenever possible. Attachments are not permitted due to technical limitations with Campusmail. Instead, add your information to your web site or Google Drive and include a link in your email. Using an email platform like MailChimp or Constant Contact to draft your email and then sending a single message to Campusmail for distribution violates those companies’ terms of service. Consider complementary communication options. For example, events can be submitted to the Campus Calendar, announcements can be submitted to inHope and you can create images to be shared on various screens around campus. Additionally, you might consider promoting larger events on Facebook, Twitter, Instagram or your department blog. Posted on October 6, 2017 October 6, 2017 Author Rebecca RobrahnCategories Public Affairs and MarketingLeave a comment on Campusmail and you! The first few weeks of classes have come and gone and we’re officially immersed in the 2017-2018 academic year. Running from classes to extra-curricular activities, both students old and new are starting to settle into their rhythm for what’s to come as the year progresses. But what if I told you there are more ways to help with this rhythm? To assist in discovering important information and acquiring access to tools that will make the day of any student easier? There are more than a few to be found around different Hope College websites. inHope also features campus announcements, news, and more. The Admissions Office isn’t the only place you can find a map of campus. 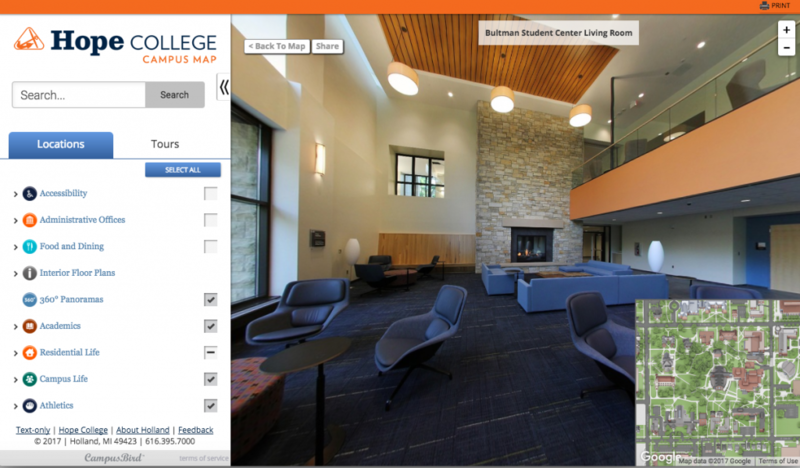 At maps.hope.edu, you can find an interactive map of our entire campus. See 360 images through the Pine Grove, the Bultman Student Center, and more. Access virtual walking tours around the residence halls and learn the history of each through information bubbles that accompany each location.You can even select the “Parking” box and easily discover which parking lots are for students, employees, or visitors. 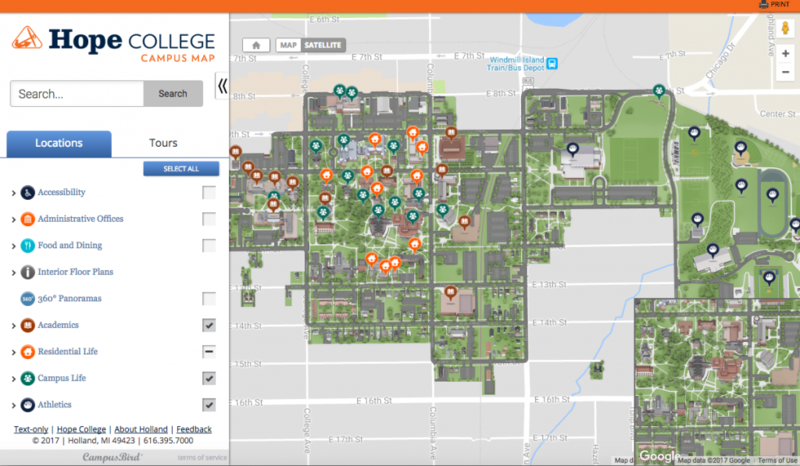 The Campus Map is a perfect way to see all campus from the comfort of your laptop or phone, anywhere you may be. When asked about what makes Hope College the best college for them, many students often respond with the word “community”. 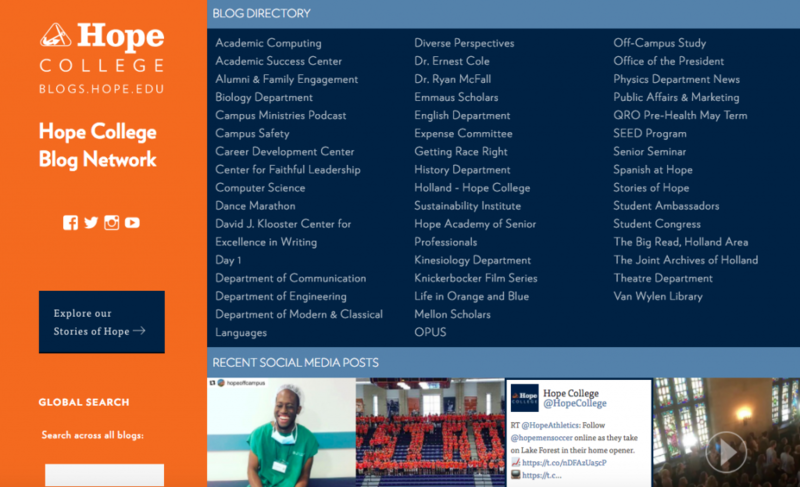 The Hope College Blog Network highlights the stories of this transformative community. From academic features to study abroad experiences, the directory of blogs from across campus share pieces of the amazing things happening at Hope and in the world. This resource is also particularly helpful for hearing what’s happening in your favorite academic departments and student groups. 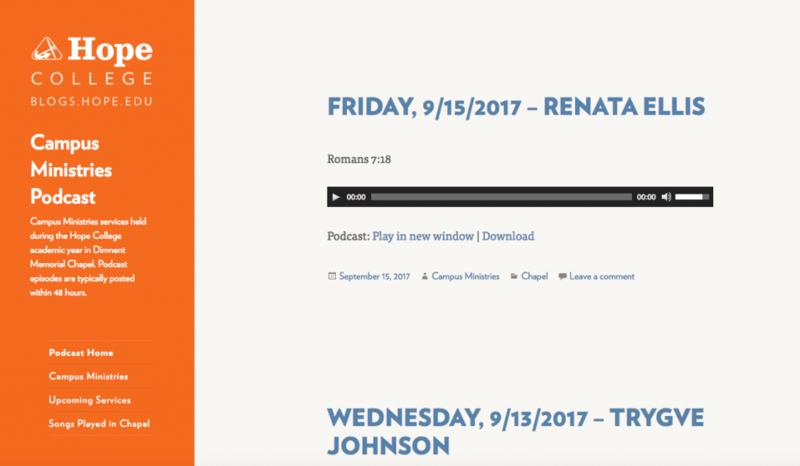 One useful blog offering, in particular, is a podcast through the Campus Ministries blog (blogs.hope.edu/campus-ministries/) which features a recording of each message given during our thrice-weekly chapel services as well as our weekly Sunday night Gatherings. 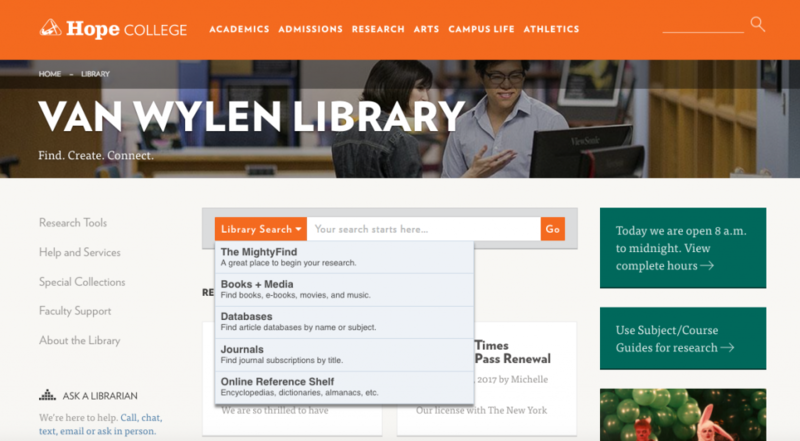 On the Van Wylen Library’s website, students have access to a myriad of search options through the library’s own resources. These include The MightyFind, a search engine optimized to assist students in starting research projects by showing them an abundance of online resources related to their subject that can be refined by content type, date published, and more. Another option included is the Online Reference Shelf, which searches through encyclopedias, dictionaries, and almanacs to further define terms and concepts. 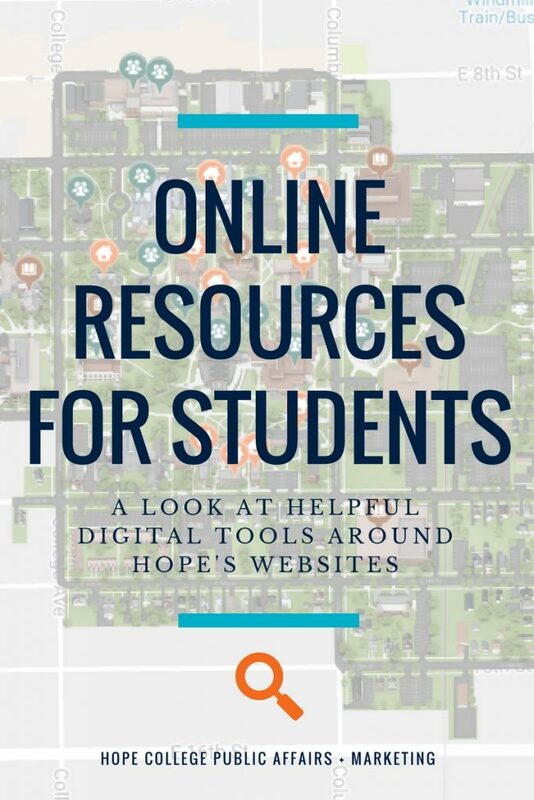 These resources are ones that will equip students with the knowledge to better tackle the year ahead and best utilize all that your Hope College education can offer. What to improve your blog this fall? Public Affairs and Marketing is hosting a Blogger Bootcamp with Elizabeth Council, digital strategist at Hope. Elizabeth helps manage our blog network, including editing Stories of Hope. 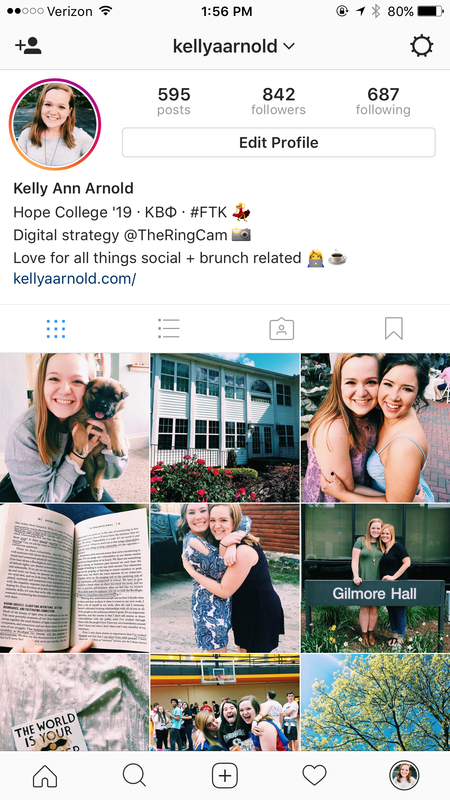 She also manages the college’s social media accounts, and wants to help you be better at sharing your department’s stories on your blog. Thursday, Aug. 17, 2:30 p.m.
Hope boasts over 40 blogs on the college’s blog network ranging in focus from faculty and administrative work to admissions features for prospective students. Public Affairs and Marketing helps maintain our network and serves as a campus resource to help our bloggers improve their site and their posts. We’re here to help you get better at blogging — and to blog more! Know your audience. Decide who you’re writing for even before you start typing. Think like your audience. What do they care about? What do they want and need to know? How do they talk and write? Write for them. What’s your topic? Start with a general topic but know that it can evolve once you’ve started and that is OK! Subheadings are great for breaking up ideas. Have a lot to say? Simplify your post with a bulleted list or create a series of shorter blog posts. At a loss for words? No worries. Sometimes a paragraph or two, or even a short list, is all you need to say. Or, if you’re stumped, start by simply ask yourself questions about your topic and then answer them. Voila! You have a new post. Include a graphic, photo or short video that supports your writing. Include links to relevant and/or additional information. If you like this post, you might like 12 Blogging mistakes most beginners make. Publish your post when your audience will have time to read it — and when they expect it. Timing matters. For example, don’t wait until two days before to tell people about your event; And, publish on weekdays if it’s work related (but avoid Mondays and Fridays). After your post is published, share it to your social media by telling people what’s in it for them. Give your followers a reason to click through. It’s OK to repurpose content over and over, too. Create a strategy for promoting your blog on social. Keep at it! Decide how often your blog needs fresh material and work to follow a consistent publishing schedule. Your followers will come to expect and enjoy your new content on a regular basis. Still have questions about improving your blog? Contact Elizabeth Council in Public Affairs and Marketing to schedule a consultation. 2017 is the year of the social media story. Originally created and monopolized by Snapchat, “Stories” is also a feature of Instagram (and Facebook, with little use), and is eerily similar to the Snappy original. It’s here that I need to admit that, when Instagram originally added the Stories feature, I was flummoxed. Flabbergasted. And angry. The update came around not long after I began my first social media marketing job. I was at work when it surfaced on each person’s phone in the office, a familiar notification in the App Store. We spent the rest of that day discussing Instagram Stories off and on. How dare Instagram rip off Snapchat?! Instagram is owned by Facebook so, to us, stealing ideas from independent Snapchat just seemed wrong; I couldn’t understand why anyone wouldn’t just use Snapchat, the home of the original story. Before I ate lunch, I posted a Snap to my story claiming my territory, promising I would never leave. And then, slowly, I began to see what makes Instagram stories unique: the quality. I started noticing gorgeous images and videos (along with the occasional amusing Boomerang). The drawing tools are smooth and alluring, and there are more distinct filters offered to lay over images and videos. As more of my friends and favorite influencers became acquainted with the feature, the more intrigued I became. Could I dare step back on my promise to defend Snapchat until its dying day? I was not the only one easily suaded by the aesthetically pleasing Instagram spin-off; according to TechCrunch, Snapchat users have been using the application 20-40% less since the launch of Instagram Stories. Instagram definitely hit Snapchat where it hurts. There’s good news here. Snapchat is not dying, with upwards of 58% of Snapchat users not being reached on any other comparable platform. Additionally, a survey conducted by WhatsGoodly in April found that 78% of millennials surveyed still preferred Snapchat over Instagram stories. And brand ambassador network Heartbeat found that out of the 100,000 13-20 year olds they surveyed, 74% post more on Snapchat than Instagram. Yet, Instagram stories are gaining traction overall, with over 200 million daily users around the world. The best news? You don’t have to choose just one. Having been a Snapchat user since 2013, I think of Snapchat as the application on my phone that most embodies its “social” label. My friends on Snapchat don’t have to look pretty, or fancy, or be doing anything particularly interesting to post to their story or send something to me privately. Concerts, hangouts and other social events are best placed on Snapchat for privacy, which serves as another draw for the platform. Unless your account is private, anyone can see your story on Instagram. To be friends with someone on Snapchat means both parties consented to add each other. That makes the experience more intimate and explains the relaxed vibe most users find on Snapchat. I head to Snapchat if I want to know what everyone’s up to tonight. 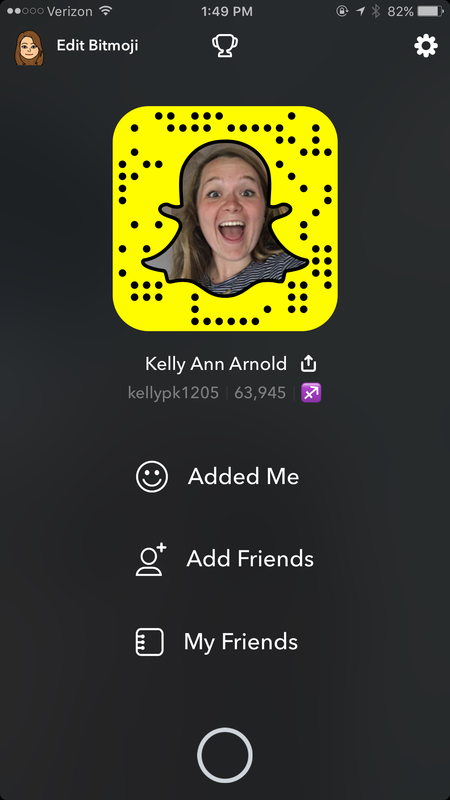 I post spur-of-the-moment videos of my friends being funny, scenic shots if the weather’s nice or not, and little victories I want to brag about. It’s where my friends are. I’ve started appreciating Instagram only really in the past year, and it’s because of newly-developed features such as the optimization for high-quality images. When Instagram updated the design of their entire interface about a year ago, every element was intentional in directing the focus of users to the images. The Explore feature works to create a community feel by offering a stream of posts by accounts you don’t follow. It allows users to view similar posts to ones they’ve already liked. Instagram allows you to discover new companies, stores, retailers, restaurants, and events to interact with socially. I use Instagram stories when I’m out to brunch with my friends. I post when the angles line up in my office, the sun hits just right, a tree or flower looks particularly alluring, or my favorite local shop has a cool display. It’s where I can build my social clout and community. 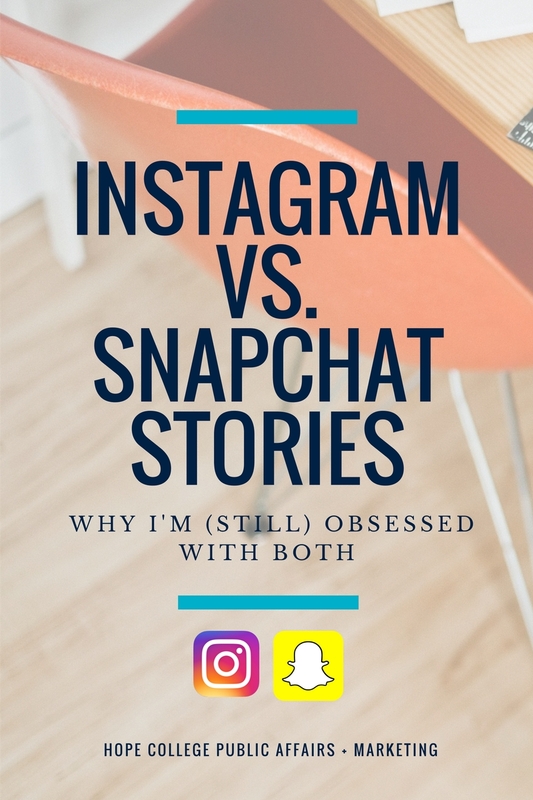 Unlikely as it may seem, many young people like myself still find Instagram and Snapchat stories relevant. Next time someone tells you they use both Instagram and Snapchat, know it’s a true story. Does your office or department frequently host events? Public Affairs and Marketing is happy to help you share your good news and get more people in your seats. The first place to start is the Hope Calendar when hosting an even for on-campus attendees. Gone are the days of simply sending a campus mail and calling it good. Entries on the Hope calendar can serve as your event’s webpage with all the details your on-campus attendees need to know: who, what, when, where, why, and even photos or a video if you have one. Guests can informally “RSVP” to show their friends they’re interested in your event, they can easily share the event to social media, and see on a map where you’re event is located. When reserving your room in EMS, select “Yes” when asked if you would like this event to display on the Hope College public calendar. Include any descriptive text that should appear on the web in the “Event Details” section of the room reservation. This ensures any potential changes in time or location are updated in both EMS and the calendar. Approved events typically appear on the campus calendar in 1–2 business days. See more Calendar tips. Include all the details you would normally put in your Campusmail such as a title, description, time, dates, etc. in the description box. Don’t worry if you don’t know all the details, you can always update your entry later by emailing calendar@hope.edu. 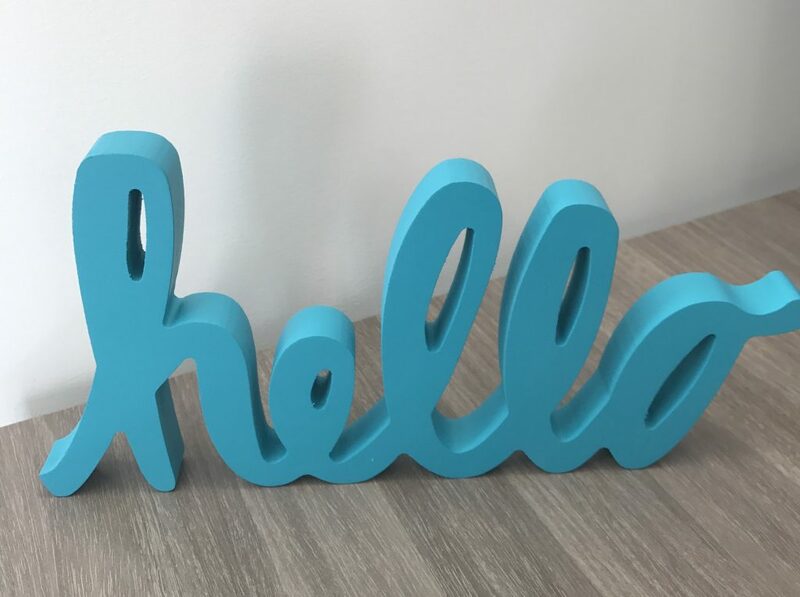 Use the same email address to send us a photo or graphic, otherwise we will choose a default image, which are usually not as exciting as one promoting your event. Please be sure your calendar entry is always current. Email changes or new information to calendar@hope.edu. Once your event is listed on the calendar and your image is in place, start tweeting about it and share it with your Facebook fans, even if it’s six months away. Always include a picture or graphic with your social media and link to the calendar entry. Consider creating a Facebook Event if you’re feeling savvy with Facebook. We can even help you link the Facebook event with the Hope calendar entry, or help you advertise the event on Facebook if budget allows. Speaking of advertising, promoting events to specific groups of people can help ensure you have a robust audience. We can help you devise a social media advertising plan if your budget allows. Don’t wait until the day or week of the event; Start talking about it early! Use your office or division’s social media channels to promote your event. Be sure to include an eye catching graphic or a photo, and always link to the Hope calendar entry or Facebook event. Use hashtags, when appropriate, but before you choose any old hashtag, talk to Public Affairs and Marketing. We’ll help you find the right one. Tag other users or offices involved in the event. Ask faculty and students in your department to share to their social media. If your event is for students, consider how Instagram and Snapchat can be utilized for your event. Public Affairs and Marketing often offers offices the opportunity to “take over” the Hope account for special events and academic promotion. For big events, have someone tweet and post to Facebook during the event. Consider adding photos and video to Instagram if your office has an account. This is the fastest growing social channel for Hope’s followers. Share photos of the event (think “behind the scenes”) or take videos with a phone. Most social media accounts allow you to look at data on your social media performance. Check it out to see which posts or tweets were most and least effective. Recycle your posts and tweets throughout the year to continue talking about the event. This will help keep it top of mind for next year. For more information on promoting your event or news online, please connect with Elizabeth Council, digital strategist, in Public Affairs and Marketing. Please stop by to visit our new office space! So What IS Public Affairs and Marketing? 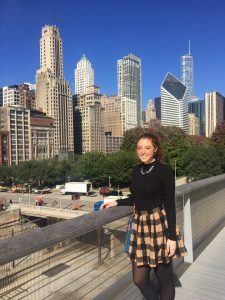 Nicolette studied in Chicago in fall 2016 as part of the Chicago Semester experience at Hope. Now, a year and a half later I find myself constantly thinking, “what is it they don’t do? !” I know, I know, this totally sounds like I’m trying to kiss up to my bosses here, but it’s true! You may have noticed that this year Hope’s Snapchat account has really gotten an upgrade. Since it’s “debut” last year there have been serious efforts made to post fun and engaging content for both prospective students and current students. And the people behind this mystery Hope College account? Yep, you guessed it, Public Affairs and Marketing. The team here are the creative minds behind Visit Day, Game Day, campus events, and even just spur of the moment snapstories. That is, unless they lend it out for a Snapchat takeover. During Snapchat take overs we give full access to sports teams or student groups to upload their own content for a fun and dynamic change of pace. 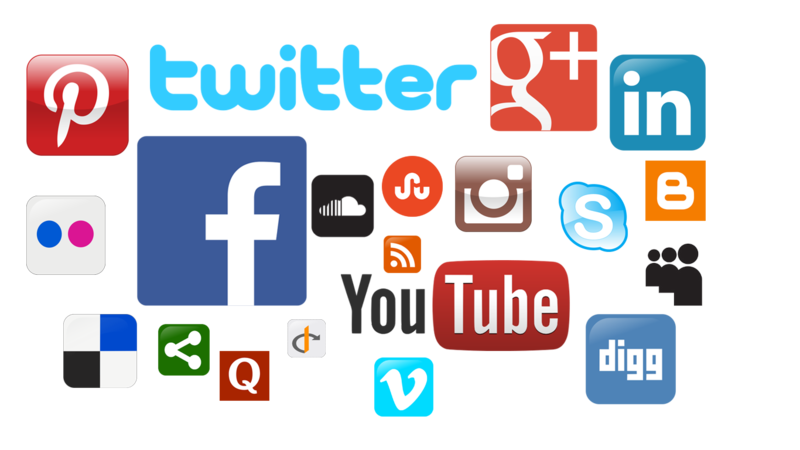 In addition to maintaining the Snapchat account, we’re also responsible for keeping up to date and relevant information on all our social media accounts, including Facebook, Instagram and Twitter. If you weren’t already aware of Hope’s presence on these platforms, be sure to check us out! We’re always eager to repost photos and tweets of Hope Students engaged in various activities around campus, so who knows, you could be featured and not even know it! But our office is about more than just social media. Public Affairs and Marketing is responsible for the new website redesign, making content more easily accessible and tailored toward students. 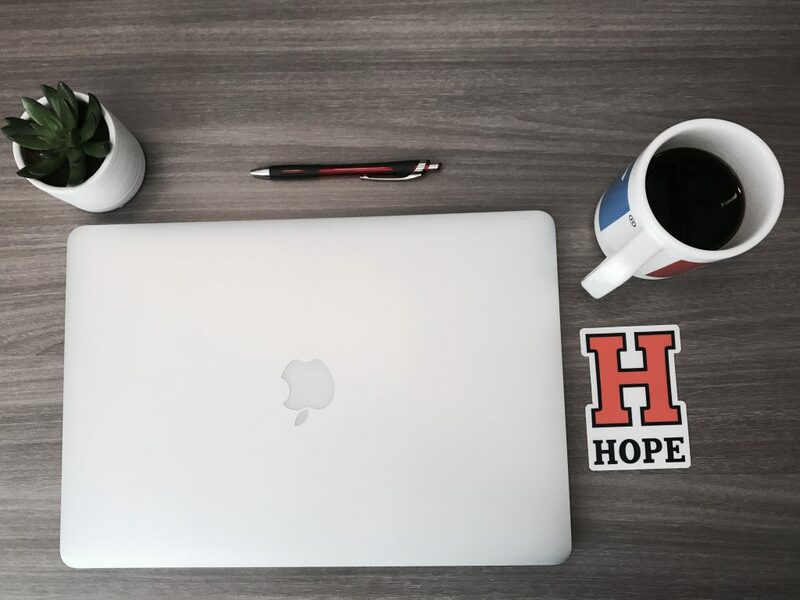 We also partner with offices and departments across campus to keep prospective students, parents and alumni involved in Hope College happenings via magazine.hope.edu, calendar.hope.edu, in.hope.edu. We work creatively to produce exciting content like videos and photos to engage prospective students, alumni, current students, and parents alike. The Creative Services team is responsible for the News from Hope College magazine redesign, advertising, dozens of event posters, department and program brochures, event promotional materials for annual events like Homecoming and enough t-shirts to fill your closet (everything from Orientation to Spring Fling). The Events and Conference office is also a part of the Public Affairs and Marketing division, which works to organize and coordinate all the campus wide events, as well as plan various conferences and arts events. This office is also responsible for managing any and all events held inside DeVos and Dimnent Chapel. So anyone with dreams of getting married in Dimnent now knows who to become friendly with. Overwhelmed yet? Well if you can believe it, this is only a fraction of the things we do here, but I hope it’s helped to somewhat back my whole “what don’t they do?” comment from the beginning. It’s an office that really does it all, but to sum it up quickly: we’re in the business of storytelling. Whether it’s via social media, words, video or art, we want the stories of Hope to be told in the best way possible. So if you feel like you have a story to share, let us know, because we want to share it! Posted on March 6, 2017 March 7, 2017 Author Nicolette DeSantisCategories Public Affairs and Marketing, StudentsTags student workersLeave a comment on So What IS Public Affairs and Marketing? 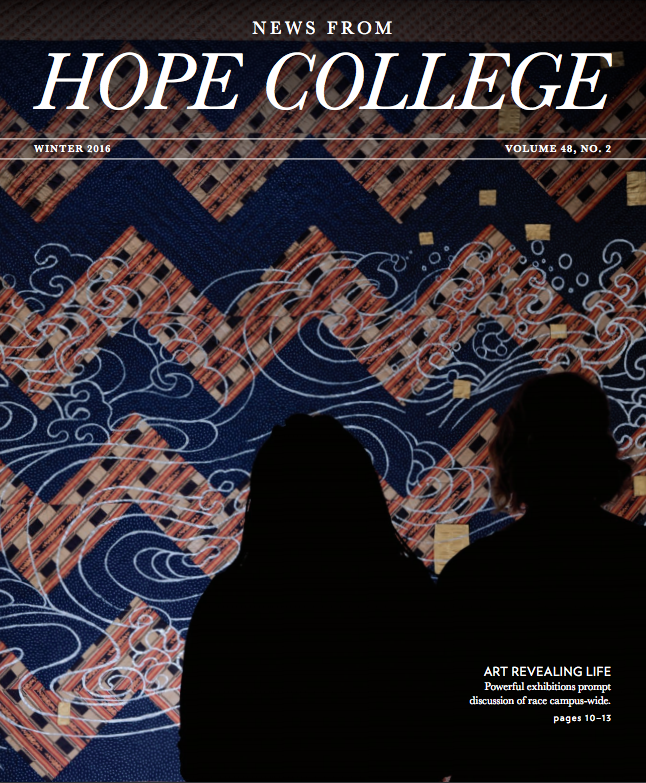 We were holding in our hands the hot-off-the-presses, newly redesigned News From Hope College. If you know the Public Affairs and Marketing team, you know we like to celebrate. Last Friday, we were feeling especially celebratory as we paged through both the print version and the web version of Hope’s flagship magazine. Admittedly, we were feeling a little tired, too. As with any design overhaul, the process was a long one. Well over a year ago, we collectively agreed that News From Hope College needed an update. It had been almost a decade since the last redesign, and feedback from an alumni survey indicated that our readers were eager for some changes. Greg Olgers, who kept us firmly rooted in Hope’s tradition of excellence. Greg, the longtime editor of News From Hope College, has provided steady leadership on the magazine for decades. Samantha Bruin, who inspired us with her creative vision and can-do attitude. Sam eagerly raised her hand for this project and kept us energized, even when the process felt like a marathon. Rebecca Robrahn, who challenged us to consider the new and the different. An enthusiastic champion of the redesign from the start, Rebecca sparked thinking on new possibilities throughout the magazine. Derek Emerson, who quietly offered perspective, posed questions and provided critique —right when we needed it. A writer at heart, Derek understands the interplay between text and image. In the final weeks before going to print, the intensity of this project increased, and Greg, Samantha, Rebecca and Derek put in some serious man- and woman-power to make sure our end product would be stellar. I suspect they’re all ready for a long winter’s nap. I am a “print person” through and through. While I consume most of my news online, I still relish the opportunity to page through a magazine over a cup of coffee. It feels like a luxury, feeling the tooth of the paper, immersing myself in the text, swooning over the photos, dog-earing the pages. Often, the web experience just doesn’t match the print experience. In the case of the News From Hope College website, however, there is much to love and much to relish. It echoes many of the great features of the redesign — a sleek new look, bold use of photography, seamless user experience. Kudos to Craig Tommola and Jason Cash for going above and beyond to ensure this beautiful website was ready to launch the day the magazine hit mailboxes. Finally, I’d be remiss if I didn’t express gratitude to Tom Renner, who laid the foundation for News From Hope College many years ago. Tom has been a faithful friend to Hope College and a cheerleader for the Public Affairs and Marketing team. We owe much to Tom! 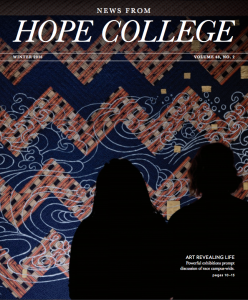 What do you think of the new News From Hope College? Drop us a line and let us know.